Magento – Move to a New, Faster Server? Is your Magento eCommerce system running slowly? We’re here to help. And to make it easy. Do you have a Magento eCommerce site, but you’re finding that it takes too long for pages to load? The average attention span of a Web user is under 5 seconds — so if your Magento site doesn’t load quickly, you’re frustrating potential customers who may just leave and go somewhere else. 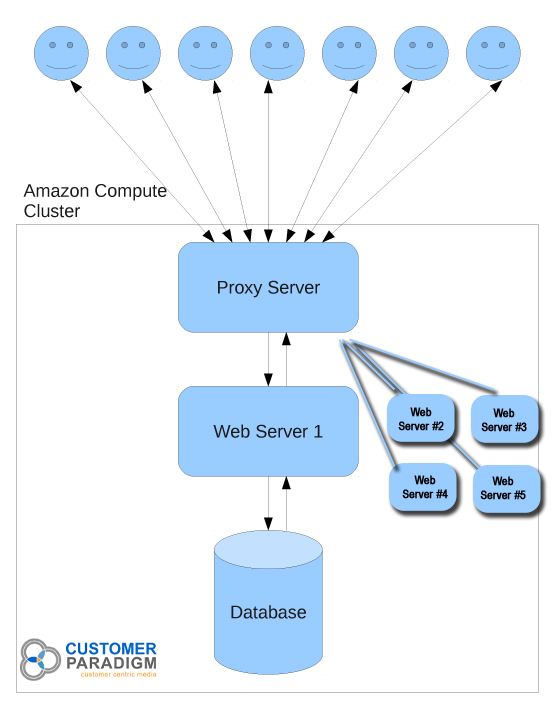 Moving your Website to a bigger server can be a complicated process. If you need a high-volume server for your Magento eCommerce site, we may be able to help you with the provisioning, migration and set up. We can make recommendations on hosting providers (they bill you directly / we’re not in the middle). Case Study: A client recently came to us with a capacity issue: their Magento eCommerce site was running slowly, and they had hundreds of users trying to make purchases and interact with the site during peak times of the day. DNS hosting: not on same server as is done now; this is often a free service by the domain name registrar. 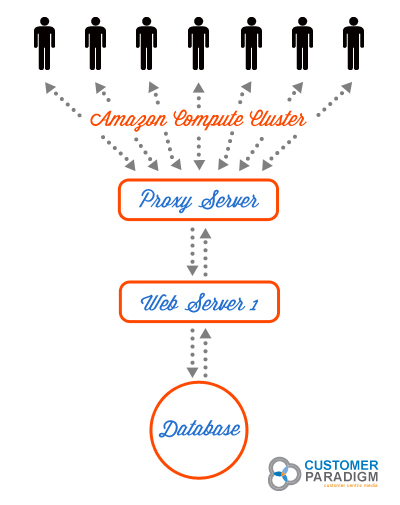 Proxy Server: handles initial data requests to the site; delegates to one or more Web servers. Web Server: one Web server will be running to handle the load; additional Web servers will be turned on automatically as demand / load increases. Mem Cache Server: we can also turn on additional by-the-hour servers to handle Mem Cache processes as needed to lessen the overall load and demand. Database Server: one server will handle the mySQL database that records all of the bids; offloading the database onto it’s own server will drastically increase performance. 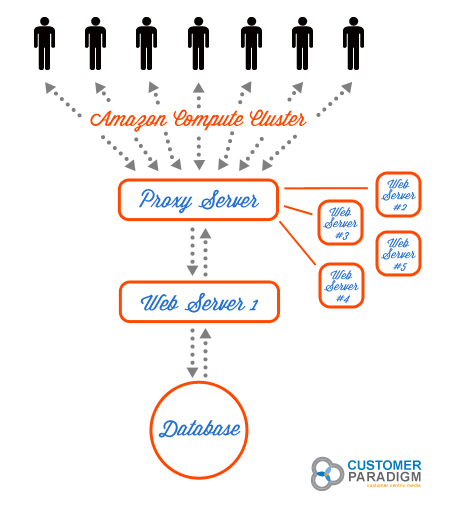 Our recommendation in that case was to use Amazon.com’s Compute Cloud system, which is best in class and allows easy expansion when needed. 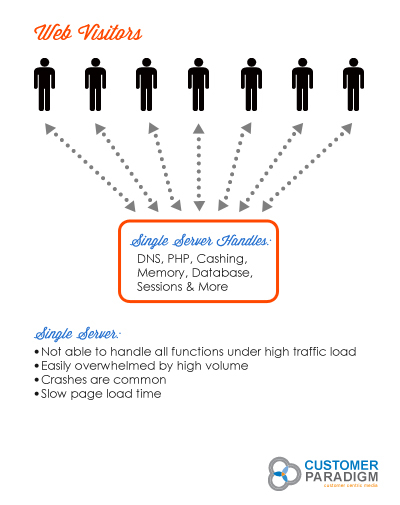 Do you need help moving your Magento site to a faster server? We can help! We can also help you install, maintain or upgrade your Magento eCommerce shopping cart system? Try us out! Get your first hour of Magento programming for Free (when you commit to a five hour or longer project). Call Toll Free at 888.772.0777 for a free estimate. What makes us different than other Magento Programmers? Bug Free Code. Our programmers write bug-free code that works. Direct Access. You’ll get the name, email address and direct phone number of your programmer that is in charge of your Magento eCommerce project. And you can come into our office any time. Low Prices. You don’t have to pay for the high rent and salary requirements of other high-priced Magento programmers. We keep our prices low, because we keep our overhead (office space, etc) as low as we can. But we strive to keep our quality and customer service extremely high. We’re not overseas. Instead of dealing with people you’ve never met on the other side of the globe, that do not speak English as a first language, and don’t understand how customers in the U.S. interact successfully with an eCommerce Website, our team ofMagento Programmers are in many cases 4-5 times more efficient than working with an overseas team. What we have found is that working with an overseas team can require a timeline that is 3-4 times longer, and requires a lot more project management, testing and quality assurance. We Answer the Phone and Return All Emails Promptly. We know that this shouldn’t be something we have to mention, but we do pride ourselves on our ability to have a real person answer the phone during our business hours, and we make sure to respond to all email requests promptly. Small Projects Are Okay. We work with small 1-2 person companies, as well as some of the largest corporations in the world. If you need a Magento eCommerce programmer, having us contact you may be the smartest thing you’ve done all year. We know you might want to test out our team first, before you commit to a larger project. And we’re okay with that. We have no minimums for working with us. Open Office Format in Boulder, Colorado. We work together in a small, open-desk office in Boulder, Colorado. What this means is that if someone has a specific question about a Magento eCommerce programming task, they can ask anyone else very easily. We’re Not A Person In Between Jobs – Trying to Moonlight as a Magento Programmer. We’re a real company with a very stable crew of Magento and php programmers. If someone is out of the office for a day, we always have someone else available to help out. This is what we do. We eat, breathe and live Magento eCommerce, along with php programming, mySQL database development and other marketing needs. Unlike your brother-in-law or a person who “thinks they can figure out Magento,” or someone who might not be there for you next week, month or year, we’re here to stay. We have systems in place to ensure continuity and success.